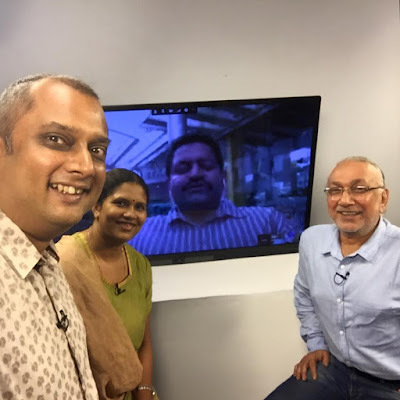 I have been a bit slow in updating about the Adda With Kalyan chat shows here that we host every Tuesday from the India Food Network studio on their YouTube channel. Last Tuesday we did one on Indian regional food going national. The dining out culture in cities like Mumbai, which has a high immigrant population, started with restaurants being set up for immigrant workers. It started with Irani cafes and then Malvani restaurants in Dadar for those coming in from the rest of Maharashtra and Keralite and Mangalorean restaurants in Fort for those from the South. With India becoming more affluent and the leisure segment growing, the focus of restaurants became on pleasure and experiential dining rather than just subsistence. New restaurants started offering international cuisines rather than regional food meant for migrants. With urban migration being on the rise in India there has been a bit of change in this pattern. Cities like Bangalore have regional restaurants, Mumbai had a slew of Bengali restaurants opening and recently an Andhra restaurants. Now some restaurants in the modern dining out space such as Bombay Canteen and Monkey Bar are pushing this trend too. Catch my chat in the video below with chef Ravitej Nath of the Oberoi Gurgaon, Rajeev Neogi of Bhojohori Manna, Srividya of Gongoora and Mohit Balachandran of Soda Bottle Opener Wala to hear the experience of the ambassadors of regional Indian food in the national restaurant scene.